Paychex (NASDAQ:PAYX) announced its Q2 FY 2017 earnings on Wednesday, December 21, reporting a 7% annual growth in revenues to $771 million. The company has reported high single digit growth over the last few quarters, with HR outsourcing and services business growing at low teens in the same period. 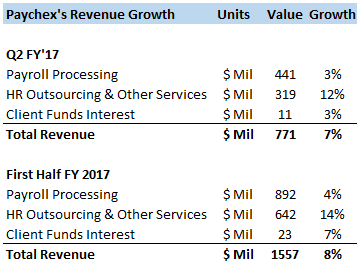 The second fiscal quarter mirrored that trend, with HR outsourcing and other services revenues growing at 12% year-over-year to $319 million as shown below. 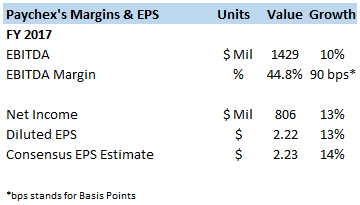 Comparatively, Paychex’s core payroll processing business has grown at a steady 3-4% over the last few quarters – a trend which the company has sustained in fiscal 2017 as well. It is interesting to note that competing HR management and payroll processing firm ADP (NASDAQ:ADP) has also witnessed a similar trend in its payroll processing and HR outsourcing businesses over the last few years. According to the most recent data in the small business jobs index released by Paychex, the index stood at 100.38 for November, which was flat over the previous year. This is a healthy sign for Paychex as the total number of clients served by these companies is likely to continue to increase, especially because small and medium businesses form its core customer base. We forecast the total number of clients to continue to increase at 4-5% over the next few years.